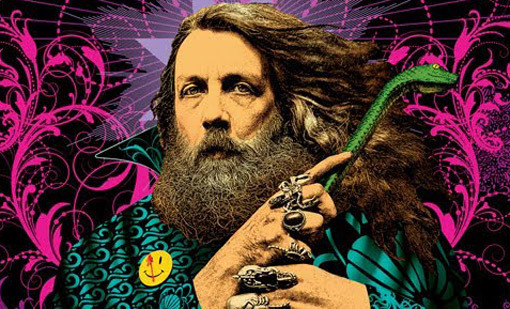 In November 1993, on his 40th birthday, world renowned comic artist and writer Alan Moore, creator of ‘The League of Extraordinary Gentlemen’, ‘Watchmen’, ‘From Hell’ and ‘V for Vendetta’, confessed to being a practicing magician. He believed that making the transition from artist to magician was a logical progression, but he nevertheless expected howls of derision from the popular press, pitying looks from his long-suffering family and groans from his legions of fans, who would think he had finally gone over the edge. ‘Too many drugs and too much Hawkind’, they would say. But those who were acquainted with Moore knew better. With his grizzled grey beard and long bedraggled hair he could pass for an aging hippy, but this was the man who almost single-handedly reinvented the medium of comics for a new adult audience, bringing literacy, politics and a masterly visual sensibility to a once crude and derided craft. Comics and their recent multimillion dollar movie adaptations are no longer for kids. In fact, the word comic is now passé, thanks almost entirely to Moore, who can take much of the credit for the rise of a new art form, the graphic novel, in which stereotypical superheroes have become subversives in a sinister neo-fascist society that could never have existed in the same universe as that inhabited by the original square-jawed legion of superheroes created by Marvel and DC. Moore is a modern Merlin, a natural successor to Crowley, Spare and Blake, but this British-born artist has the advantage of having both feet on terra firma having endured the hard knocks of the real world and having had to scramble for a living. Yet despite his wealth and fame, he continues to live in a modest terraced house in Northampton, where magical artefacts and occult volumes tumble from overcrowded shelves or vie for space with records, videos, comic book collectibles and memorabilia. His house has been described as ‘an occult bookshop under continual renovation’. As one bemused visitor observed,”‘this is clearly a man who spends little time on the material plane”. 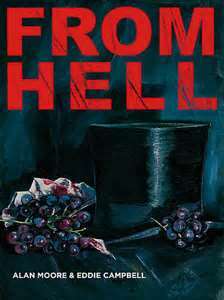 Moore’s obsession with the occult was triggered by a casual remark he wrote in his first highly influential and ground breaking graphic novel ‘From Hell’ which retold the story of the Whitechapel murders perpetrated by Jack the Ripper. Like Blake and Spare before him, Moore believes that magic is an art and that all art forms are a form of magic. Both involve the manipulation of symbols, words or images to achieve changes in consciousness. Less than two months after his ‘coming out’ party, Moore had what he considered to be his first magical experience. He was performing a ritual with a friend when they were both struck by what felt like a non-lethal bolt of lightning. Even though he readily admits that he didn’t always understand what he saw or encountered, he knew he had to continue until he could make sense of his experiences. To assist him on the astral plane he adopted an ancient Roman divinity, the serpent god Glycon. He knew Glycon was a false god, but he adopted this particular deity anyway, because the snake is a powerful image. Moore did not need to be told that imagination was the key to occult experience and that the world of the imagination is not to be confused with fantasy, but is another reality. Magic, he explained, was a method for dealing with the invisible world, the world of ideas from which everything in the material world has its origin. The divinities and demons of our ancestors were the names they gave to inner forces they did not yet understand and so they personified them to help them interact with these inner attributes. The world of ideas is therefore more real than the material world, even though it is not a physical reality. Ideas, Moore reminds us, are immortal, immaterial and universal, but they remain elusive and impenetrable without a system to give them structure in our minds and that is what ritual magic can offer. God as envisaged by the founders of the western religions has no place in this pantheistic universe where the divine life force and every living thing in existence are indivisible. Moore has no issues with the creator – it’s the middle management that he objects to. In Moore’s popcorn philosophy, God is akin to Elvis and religious authorities are all clones of ‘Colonel’ Tom Parker, marketing his property to those starving for spiritual sustenance. Many might consider that it takes more than a leap of faith to connect comic books and pop culture with occultism, but as Moore observes, the graphic nature of comics seems to stimulate the right-hand hemisphere of the brain, the side that relates to the imagination, or the underworld of the unconscious. In Moore’s opinion, the various religious can be compared to the languages of the world, each expressing the same ideas in a different form, while magic can be likened to linguistics, the science of language. Magic, according to Moore, is not a ticket to an alien environment, but a new way of seeing the world around us, a different way of perceiving what the rest of us take for granted. He likens magical consciousness, the altered state of heightened awareness, to a musical fugue in which many melodic lines are played simultaneously. The listener can choose which strand to focus upon or simply allow the counterpoint to wash over them, although he admits that during a magical operation the images and sensations are not always as harmonious, nor as uplifting as the musical variety. It is more likely to be ‘disorientating, overwhelming even terrifying’.